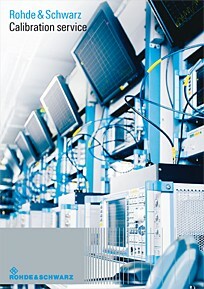 You expect exact results from your Rohde & Schwarz T&M instruments – so do we. Calibration that simply documents the current condition of an instrument is informative, but not always sufficient. Of course, every T&M instrument ages. Recognizing and optimizing the resulting changes is routine for us, allowing us to help ensure the quality of your work. As a manufacturer, like you we know that you must be able to rely on the precision and trueness of your measured values. Before the calibration itself, we use a computer‑controlled diagnostic system to check your instruments and scan them for viruses. Following initial calibration and based onthe status of the instrument, we use state‑of‑the‑art procedures for all necessary hardware modifications and parameter adjustments. Our service also immediately takes care of any adjustments or repairs that are determined to be necessary during calibration so that no time is lost. After all issues have been resolved, your instruments undergo another complete calibration cycle. You receive back high‑precision T&M equipment that performs like new. 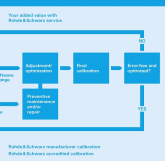 During a Rohde & Schwarz calibration, your instruments are checked for deviations and automatically adjusted to restore them to their optimal performance. Our ISO‑compliant calibrations help minimize measurement errors and scrap rates during production. Theyalso help you ensure the consistent quality and reliability of your measurements and generated signals. As the manufacturer, we thoroughly test your instruments. We not only make adjustments when values fall outside the tolerance range; we also optimize deviating values even when they fall within the acceptable tolerance range.